Despite being a long-time fan of Penny Arcade, and falling in love with the XBLA demo of On The Rain-Slick Precipice Of Darkness so quickly, I bought it day one, I never actually got around to playing the game, or its follow-up, until the franchise had changed developer hands from Hothead to Zeboyd, who recently put out the third episode. On the plus side, this gave me the chance to experience the entire saga thus far in one fell swoop, and give my impressions of the whole thing untainted by time or nostalgia. I loved a lot about the first two games, which I'm addressing as a cohesive whole for the most part given how tightly they, by design, tied into one another. As mentioned earlier, I've enjoyed the Penny Arcade comics almost since their inception, so it was nice to see the writing was spot-on with the strips, save for an over-reliance on profanity that becomes more and more frequent as the games progress. Not that I mind the comic's use of foul language, and I went in knowing it would probably be part of the package, but it reached the point fairly early on where it felt gratuitous and unnecessary, to the point of ridiculousness. Conversational tone drifted from the occasional bout of legitimate outrage to a trio of foul-mouthed hooligans replacing my character and the alt-versions of the Gabe and Tycho I'd grown to know and love. Visually, the game also does a bang-on job of staying consistent with Mike Krahulik's art style, translating well into three-dimensional models as well. 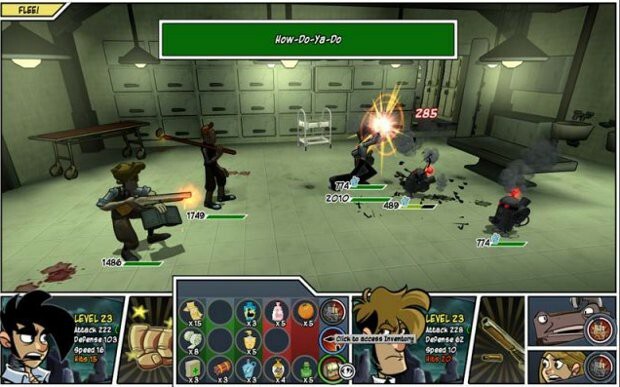 Everything looks like a living, breathing transplant from an actual Penny Arcade strip, and Hothead even went the extra mile to make sure player-created characters were included in the motion-comic-styled cutscenes and fit in with the overall look, while still offering a solid base of customization choices, which were great in the first game and further built upon in the second. The inclusion of concept art and game-only strips as bonus material was a great idea as well, but I am, admittedly, a sucker for concept art. Gameplay, on the other hand... could have been a lot cleaner. Rain-Slick Precipice I and II feel like they're trying to be too many different kinds of game at once, with a fairly robust point-and-click adventure core interrupted regularly with overly tedious, item-heavy combat, which leads to grinding not in a leveling sense (as enemy groups, once defeated, do not return), but in the regular revisitation of old areas to try and fill one's inventory back up. The combat in particular drove me nuts, between the item dependancy, the uneven difficulty jumps between certain portions of the game, the overly long wait times in the active battle system, and the heavy reliance on well-timed button presses to reduce damage, which would've worked great had enemies any consistency in their tells as to when to try and defend. For example, you'll face one variety of enemy that requires you to block as they're hauling back to throw an item at you. Later on, you'll face different projectile-wielding enemies, so of course you'd want to block as they wind up as well, correct? Nope. You won't get a clean block in unless you wait until just as they release the thrown weapon. Same goes fairly frequently for melee combatants as well; one enemy's block opportunity will leave you with a missed block on another, despite fairly similar attack animations. And when you miss a block, you pay. Even partial blocks are essential to surviving most battles. As for the whole item affair, fights often rely heavily on status-altering items, be it slowing down an opponent, lowering their defenses, or rebuffing your own party after they've been hit with status ailments themselves. It helps a bit that the first option to ready up in a fight is your item cache, but more often than not, any effects you manage to get off will be nullified within one or two characters' attacks. To make things more frustrating, only one effect, positive or negative, can be in place on any character at a time, making stacking ailments or buffs to make your life easier an impossibility. Sure, it's easy enough to wander around between fights refilling your stores, but it's so time-consuming to run around everywhere, especially when you start getting endless dupes of items you're already full up on, that it just compounds the annoyance factor. And the real time combat itself? Far slower than it needed to be. 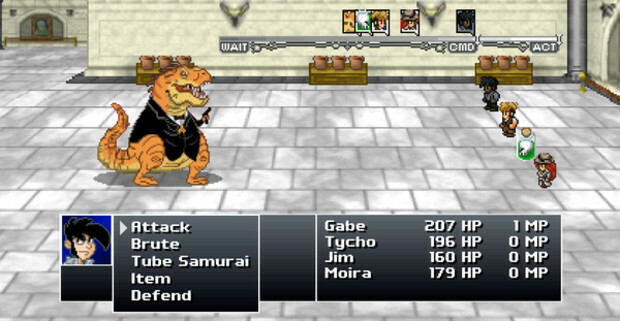 Your character's actions are set to three buttons: Item, Attack, and Special, which fill up like timers one after the other at different rates for each character, giving you fairly instant access to any healing you may need, but forcing you to wait and block if you want to deal any damage, and even longer if you need special attacks for tougher enemies or foes with specific weaknesses to specials. Or, heaven forbid, targets that are only vulnerable to team-up attacks, which requires waiting for more than one character to fill their special buttons so they can combine forces and bring the hurt. I think with a bit more hasty default speed, even if it meant faster enemies as well, Penny Arcade Ep. I & II would've felt a lot more like adventures and a great deal less like waiting games. While a more minor complaint, I also frequently mis-clicked and didn't set a waiting attack on a given enemy while in combat, be it because I clicked on their shadow or a few pixels away from their body proper. It's not as if the enemies clumped together at all, so a more generous hit box for targeting purposes would've been nice as well. And, despite being excellent, I felt the music choices in each of the first two episodes were rather sparse. When the unlockable record collection in your extras section only has room for five or six songs in each game, you can imagine just how much looping and re-use of music, or absence thereof altogether, comes up over the course of several hours of gameplay. Upon being handed over to Zeboyd Games, known for the retro, reference-filled Cthulhu Saves The World and Breath Of Death VII, the Rain-Slick Precipice series takes a rather extreme turn, favoring a sixteen-bit, console RPG style to its modeled and rendered predecessors, and shifting toward a writing style more consistent with Zeboyd's repertoire as well. Not that this is a bad thing, by any means. just a bit jarring for those used to the first two games' style. Zeboyd maintains their reputation for referentiality in RSPoD Ep. III, but balances these nods between role-playing classics and Penny Arcade lore pretty well. The game includes mentions of and nods to things such as the Elemenstor, Rex Ready, the Cardboard Tube Samurai, and other PA obscura, right alongside homages to SNES (and even NES, for one area)-era role playing games, as more as more recent and lesser known titles such as Okage: Shadow King, much to my delight. Also present are strong ties to the previous two Penny Arcade games, despite the passing of the torch, with locations and secondary characters returning and remaining consistent with their Hothead-established definitions. The only thing to which I didn't see any allusion, which I may just have missed, was the safe deposit box for which the key is a secret item obtainable in Episode II. Given that you go to the bank in question for a sizable portion of the game, I at least expected a "Oh, hey, I have a key for this," or something along those lines, revealing a special item, regardless of whether you actually managed to get said key in the previous episode or not. Also disappointing was the flip-flop from items being essential to them being pretty much useless. Considering you can actually go out of your way to obtain use count upgrades for the items in this episode, which regenerate after every battle rather than having to be hunted down over and over, I thought I'd need them more than half a dozen times, and that I might need more than just Potions. Nope. This could, in part, be due to the imbalanced nature of the job system, which is its own little problem. Characters in Rain-Slick Precipice III are equippable with one, and later, two job pins, expanding their repertoire of skills and buffing certain stats based on the job. Almost all of them are referential to the comic strip in some fashion, which is great and often hilarious, but only a handful of the excessive amount thrust upon you are particularly useful, if not abuseful. Sure, the Dinomancer's a fun time, but more often than not, you'll find yourself killed before you return to your normal, controllable shape, and prove fairly ineffective while in terrible lizard form. The Slacker was one of my personal favorites, but eventually proves more a distraction than anything worthwhile, especially in the late game. Other classes, such as the Diva and Masochist, are pretty depressing when it comes to movesets, but offer great buffs, and feel like they may as well have been translated into pieces of equipment rather than jobs the way they hang on your characters and rarely see use. That being said, those buffs prove fairly functional when overpowering your characters. By blowing Moira's Speed through the roof, loading down Tycho with Defense and the powers high Def lend to a Crabomancer, and throwing the apt combination of Cardboard Tube Samurai and Masochist on Gabe, you can throw whatever you want on Jim and destroy almost anything. I think I lost all of three battles the entire game, and, as I mentioned, rarely needed items to keep things going. There's a decided imbalance in the job system, and I hope it gets cleaned up a bit in Episode IV. Even with the easy over-charging, battles still tend to maintain enough difficulty to keep the player's attention in most cases, and the battle system's a nice change from the one provided by Hothead. Time based to an extent, characters take turns as they reach the end of a bar along the top, and are allowed to have their action set as soon as they get to a short section before that end. Attacking an enemy who's in that section of the bar before they get a move off will also knock them back along the bar a fair bit, while attacks inflicted while not in that sector will still provide smaller delays, making it possible to stall an enemy for two or three rounds or even entire battles with good timing and observation. Somewhat similar to Ep. I and II is the action point system, though instead of waiting for something to fill to gain access to more powerful moves, AP are gained every turn a character does anything but use a special attack (attacking, blocking, or item usage). The more AP stockpiled, the more and better moves you can use to wreck face. All in all, I feel Zeboyd's shift in direction with the series was a welcome breath of fresh air, and I appreciate where they're going while still maintaining respect for the better aspects of the source material they were given. Despite ending a bit abruptly, the game sets itself up well for the fourth (and likely final) installment, and the promise of additional, free DLC quests, including one explaining the absence of your user-created character this time around, makes up for any shortcomings when it comes to game length. Which, I assure you, is not an issue; even with all the backtracking and item scrounging, both of the earlier episodes prove far shorter than Rain-Slick the third. I'd definitely recommend picking up all three, just to get the full story and all of the humor packed into the series thus far, but On The Rain-Slick Precipice Of Darkness: Episode III takes the cake by far, and is worth looking forward to as you slog through Episode I and Episode II. Hothead, Zeboyd, and the Penny Arcade boys have gone a long way toward creating a rich, entertaining game world that stands alone fairly well regardless of any ties to existing PA material, and it would be a shame for any fan of the comics or of role playing games to overlook these.